We distribute iPod & iPhone accessories worldwide. Crafted from Saffiano leather. Case exterior has two slots for credit cards or your ID. We distribute iPod & iPhone accessories worldwide. Crafted from genuine Saffiano leather. Exterior slots for two credit cards or your ID. Crafted from genuine Saffiano leather. Folio design with a black leather finish. 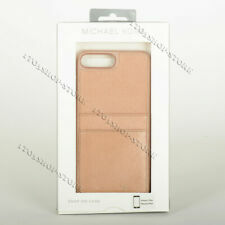 - Case interior has three card slots and a dedicated spot for your iPhone. Wrap your phone in luxury with this chic Pocket Case for your iPhone X. Crafted from Saffiano leather. Crafted from genuine Saffiano leather. Wrap your phone in luxury with this chic Pocket Case for your iPhone 7 & iPhone 8. Two slots on the case exterior hold credit cards or your ID. for iPhone 8 & iPhone 7, Rose Gold. MK iPhone wallet case. 🌻 Fits IPhone 7 Plus or iPhone 8 Plus. 🌺 3 card pockets for ID or credit cards. Fits iphone 7 Plus or 8 Plus. The strap is included but is removable if you don't like it. MK iPhone wallet case. 🌼 Case is not detachable from the actual wallet case. 🌻 Fits IPhone 7 Plus or iPhone 8 Plus. It is worth taking a couple minutes to go into your phone settings and double check your phone model/size. 🌻 Fits IPhone XR. MK iPhone wallet case. 🌼 Case is not detachable from the actual wallet case. It is worth taking a couple minutes to go into your phone settings and double check your phone model/size. MK iPhone wallet case. 🌻 Fits IPhone XS Max. 🍀 Pocket area for cash. Crafted from genuine Saffiano leather. Get the protection you need and the style you want with this streamlined Folio Case for your iPhone X iPhone XS. · Crafted from genuine Saffiano leather. Fits: iPhone 8, iPhone 7, iPhone 6 and iPhone 6 (4.7" screen). · Compatible with the iPhone 8, iPhone 7, iPhone 6s and iPhone 6. (DOES NOT FIT LARGER IPHONE 7PLUS & 8PLUS WITH 5.5" SCREEN). This only fits the IPhone 7 & 8 with the 4.7" screen. MK iPhone wallet case. 🌻 Fits IPhone XS Max. 🌼 Case is not detachable from the actual wallet case. It is worth taking a couple minutes to go into your phone settings and double check your phone model/size. Fits iphone XS Max. The strap is included but is removable if you don't like it. Case interior has three card slots and a dedicated space for your iPhone X / iPhone XS. 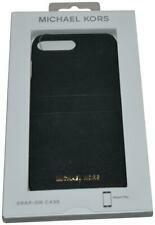 We distribute iPod & iPhone accessories worldwide. Crafted from Saffiano leather. Wrap your phone in luxury with this chic Pocket Case for your iPhone 8/7/6S/6. Crafted from Saffiano leather. Material Saffiano leather. Two slots on the case exterior hold credit cards or your ID. Fold Over Case for Iphone 7 & 8. LOVE in Shiny Gold Studs. This is a used Michael kors leather wallet folio case used in an iPhone 8 ( I think it’s compatible with the iphone 7). NOT for the plus models!! It is in beautiful condition except for the magnetic closure. The leather on these cases tends to crack where it folds over. Please look at pictures carefully. It is completely not visible when case is closed and doesn’t have any effect on the cases closing and safety for your phone. 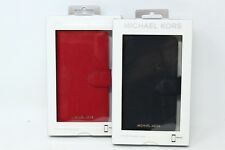 Michael Kors Saffiano Leather Snap On Case for iPhone 8 Plus & iPhone 7 Plus Gld. Condition is very good. No box case only. Shipped with USPS First Class Package. Michael Kors iPhone 8 Plus iPhone 7 Plus Safiano Leather Folio Case - Black. Condition is Used. Will have sings of use like scratches or dirt marks. Shipped with USPS First Class Package. Beautiful GOLD design with 2 credit card pockets. For Apple iphone 6s plus. 🌻 Fits IPhone X or iPhone XS. MK iPhone wallet case. 🌼 Case is not detachable from the actual wallet case. It is worth taking a couple minutes to go into your phone settings and double check your phone model/size. Wrap your phone in luxury with this chic Pocket Case for your iPhone X. Crafted from genuine Saffiano leather. 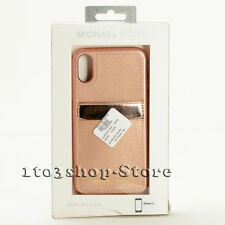 MK iPhone wallet case. 🌻 Fits IPhone XS Max. 🌼 Case is not detachable from the actual wallet case. ⚘ Lightweight and magnetic closure on flap. It is worth taking a couple minutes to go into your phone settings and double check your phone model/size.